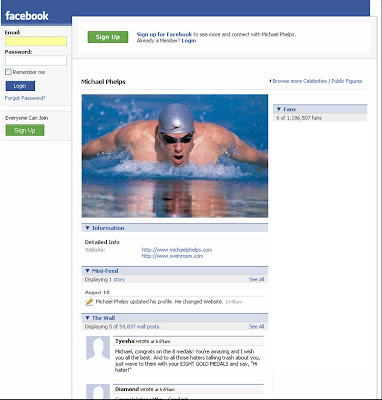 Michael Phelps Facebook Fan Page has over a million Facebook fans - he's a Facebook phenomenon! 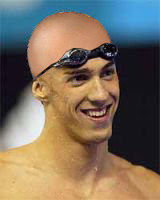 Michael Phelps, 8 gold medals and a million Facebook fans! The Michael Phelps Facebook Fan page now has over a million Facebook fans and is the second largest Facebook Fan page (only Barack Obama has more). 'He's half my age but I still think he's hot"
On top of this, Michael Phelps in an NBC TV interview Micheal Phelps claimed he has received 7600 Facebook friend requests to his personal profile. So if you want to be big in social media get good at swimming!